Friday Create Along giveaway, on a Wednesday! I’ve done some poking around and found some neat patterns to add to my growing list of ‘make this for the create along’ items. Luckily I’ve also dome some asking around and I’ve been told I’m allowed to share a pattern or two with a lucky reader. I’m also going to challenge myself here and switch to a crochet pattern and hope for the best. These are adult slippers, but Two Girls Patterns also have a toddler version . . . sometimes it’s a good thing I have 2 boys. Sooooo if you would like to win a PDF copy of this pattern leave a comment below. You don’t have to jump through any hoops to win. However, I would love it if you can actually make the slippers for the Create Along and if you could share your creation (email me or post it in the Flickr group). I’ll keep the comments open until Friday’s Create Along post, which, if I’m honest with myself will probably go up in the late afternoon for me now that Friday is one of my full days at work. I’ll pick one lucky reader and email them a copy of the pattern. Then we can get our crochet on! Good luck everyone. This entry was posted in createalong and tagged create-along, crochet, Etsy, giveaway, slippers. Bookmark the permalink. 25 Responses to Friday Create Along giveaway, on a Wednesday! ooooh.. I have been wanting this pattern for awhile now! Lovely! I do enjoy following your sew alongs, but a crochet along sounds great too–and that is a SUPER cute pattern. oo so cute! i’d love this pattern! These slippers are so cute. I’d love to have this pattern!! Great pattern! I’d love to win a copy. Would love pattern. So cute. I have been searching for a cute pattern slipper for a VERY long time. All of the free patterns are for frumpy old lady slippers! My fingers are crossed that I win, so I can make them for a cold, chilly, Nebraska evening (or morning)!! I’m am avid crocheter and these are the cutest slippers I have ever seen. I think all the women in my family need them for next year! I may have my year of projects planned out. At first I thought, slippers? For real? And then the picture loaded and of course I was like OMG!! I love them!!! Please add my name!! OOOOO these are cute!!! I’ve made ones similar that I knitted and then felted but these look easier! Pick me!!! Oh, pick me! These are super cute. Absolutely awesome … I would love to get my hands on a pattern for these!! I have been very much enjoying reading your blog and being inspired by your crafts for the past couple if months! I’m not so great with a sewing machine but I do love to crochet and these slippers are the cutest thing I have seen in a long time!!! I’d love to make some for my sister for Christmas!!! I really love these, the are so pretty! I am thinking some for me.and a pair for my two little girls too!! OMG so lovely!! 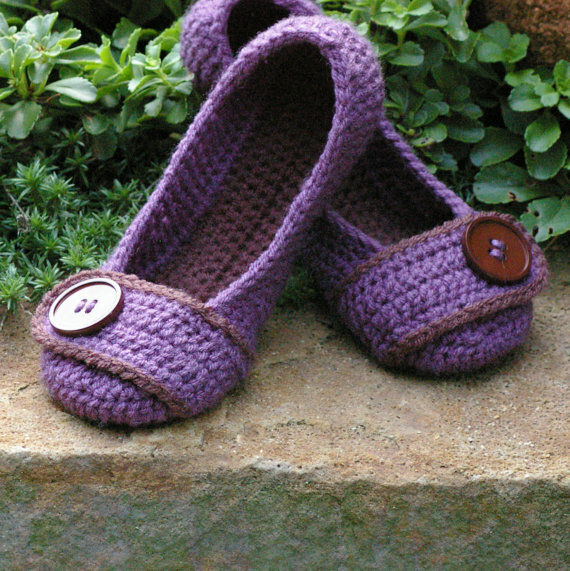 I have been looking for some crochet slippers for awhile that i really like and these are so beautiful and stylish looking! Omg I just added this pattern to my favorites on etsy last week!! They’re so cute and.cozy looking!! Wow, what luvely slippers! And the large button is just too cute for words. Oh my can’t believe I missed this!! I’ll have to get the pattern and send you a pic! very cute….i would love a copy of this pattern. Oh, I would love a copy of the pattern for these slippers. They are adorable! So very cute, I so would love the pattern! I have been looking for a lovely pattern that will make my plates of feet look nice with some home made slippers…I think this is the pattern….I would love a pattern to help me make them.